Most of us who are active think that we have a pretty good grasp on the whole walking thing, right? And sure, doing a simple hike in a local park might not require a good walking stick, but for serious treks you should consider getting yourself some good trekking poles. These are not just for backpacking or mountaineering. According to some experts, trekking poles are good for people with bad knees cause they lessen impact on your knees by around 40%! Even if you don’t have bad knees (yet), they are still good for making your activities more of a low impact thing. And a set of these should really be an essential part of your outdoor gear. This is the one thing I wish I’d taken with me to Petra and Cappadocia. Now I take them on all of my hikes, and they were really a blessing on the trails in Sedona where there was a lot of loose gravel and sand. If you’re new to trekking poles, then you might be wondering what exactly these things are and why you need them. Those of you who do a bit of skiing probably already know that their design came from cross country ski poles. In fact, trekking poles were first designed to be used by snowshoers. But theses days trekking poles are used by everyone from trail runners to hikers to hunters. As you evaluate all the different trekking pole models that are out there, you should look for the features that are most important to you. As you do a bit of comparison shopping, you will notice that features vary between the different brands and models. Let us help you know what to look for when shopping for a pair of these. Length – Adjustable or Fixed? You can find trekking poles in different lengths in order to get the best fit for your height. And for those of us who enjoy having as little as possible with us when being active, you can even get trekking poles that fold up and fit in a backpack or cargo pocket. Did you know that some poles have an adjustable length though? One reason why this type is cool is because it means that you can switch out your poles with friends and family. Adjustable poles can also be good if you’re buying these for a teen who hasn’t stopped growing yet. One word of warning – the adjustable models do tend to be a bit heavier than their fixed length counterparts. You can choose between flick-lock, twist-lock, and pull-lock. The twist and lock variety is normally found on cheaper models. But, the flick lock lever action models are both higher quality and easier to adjust. Here’s a breakdown of how each type works. Flick lock poles have a small lever that is on each segment that is adjustable and you just open and close it to lock it into your preferred length. Twist-lock poles require you to actually twist each section against one another to lock it into place. Pull-lock poles have an internal cable that locks the pole into place when you pull on the handle. We recommend that you look for poles that have the flick lever locks as they tend to offer the best performance when it comes to getting your pole to the length you want and keeping it there. Each of these has their advantages and disadvantages, which really just leaves the design down to personal preference. For the most lightweight & compact trekking pole, go with the folding tent pole design. For the strongest trekking pole, go with the two-section model. And, if you want the perfect combo of the two, go with the three-section model. A three-section telescoping pole is the most common because it perfectly balances rugged durability while being compact and lightweight enough to pack. So, most people who are hiking, backpacking, mountaineering and climbing will find this to be the perfect type of design. Carbon fiber and aluminum are the two types of materials that you most commonly see trekking poles made out of. The aluminum ones are heavier than the carbon fiber ones. Carbon fiber is the stronger of the two, however it cannot withstand dents or bangs and can get cracks and be useless. I find that the carbon poles are better at shock absorption, but all it takes it accidentally kick it one time to break it. So, if you’re a bit clumsy like me, aluminum is probably a better choice since you can still use it with a dent and the carbon just up and breaks on you. But hey, if you’re not rough on the poles, definitely get the more lightweight carbon! Though some hikers forgo even using the wrist straps, I find that they are a nice feature to have. The most important thing you have to think about with this feature is – will the strap irritate my hand on a long trek? For that reason, you need to make sure that the strap is comfortable and doesn’t chafe or otherwise irritate your skin. In my experience, the high quality brands all have straps that are comfortable. And remember, the proper way to wear the straps is to enter your hands from the bottom opening of the straps. The baskets on the poles vary depending on what the conditions the poles are designed for in the wild. For instance, small baskets are great for hiking while larger ones are good for snow. And if you try a pole with a large basket in the woods, then it will end up getting stuck is bushes and other organic debris. That being said, there are a few brands (Black Diamond, Leki) make some poles with baskets that can be changed out, but most of them do not have this capability. This features has some advantages and disadvantages. It’s great for lessening the shock impact on your way back down a trail, but doesn’t offer much on the way up. Also, on rocks and where there’s water, you get less stability with the shock absorbers than without. Of course, the perfect solution here is a pole that gives you the ability to disable the shock absorbing feature. Depending on the material of the pole, you will notice a difference in the weight of the poles. At first glance, the few ounces difference might not seem like such a big deal. But, you need to consider how you will be using these poles, cause if you’re lifting these in your arms for thousands of steps a day on a weekend backpacking trip, then those few ounces are really going to add up. We suggest getting the most lightweight poles you can find that meet your needs. Your arms will thank you for it later! Another important feature to pay attention to is the handle. Not only will you find differences in the material used for the grip, but also some of the handles are ergonomically shaped. Foam, rubber and cork are what you most commonly see used in the grips. Cork is cooler than rubber and conforms to your hand. But, they can be heavier and make your hands sweatier than foam. But rubber is the heaviest. For those sweaty hands, rubber won’t absorb moisture and foam absorbs the most. Foam feels the least cold, if that matters to what you’re using the poles for outside, but are not good for snow. If you intend to travel with your trekking poles or cover a lot of space with them, then packability might be important to you. Shorter poles and folding poles are the easiest to get into a suitcase or backpack. Here you should look for something that will easily fit in a daypack or your backpack, if you’re shopping for a backpacking trip. And you don’t want something that takes up a lot of space in your pack – so the more compact the poles are, the better! Do I Need A Women’s Pair? So some women may prefer the gendered version of the unisex products for a more comfortable experience on the trail. As you shop around for the best trekking poles on the market, you’ll notice that you can find something to fit any budget. There are plenty of cheap trekking poles under $100 that you can buy, some that are even under $50. Of course, if you spend a lot of time trekking, then you’ll likely want to spend a bit more for some higher quality walking sticks. Even then, you’ll see plenty of high quality trekking poles with affordable prices. So, how much should you spend? Well, think about it like this – you only need to buy trekking poles once since they are built to last. So, spend more now for the best ones that you can afford and you’ll be doing yourself a favor in the long run. Overall, they offer a pretty good value for the money and they have a long life span. If you expect to get a lot of use out of these things, then spend more for better quality. But don’t sweat it if you can’t go with a top of the line set of trekking poles cause you can find plenty of great cheap models that are worth the money. One thing to keep in mind is that some of the cheap models are really poor quality that can ruin your experience out on the trail. For instance, you may have cork grips that seem to crumble in your hands during use or a foam grip that is super uncomfortable. So, be careful how cheap you go when shopping for a pair of hiking poles. Black Diamond Alpine Carbon Cork Trekking Poles carbon cork 1 lb. 1 oz. Black Diamond Trail Back Trekking Poles aluminum rubber 1 lb. 4 oz. Black Diamond Trail Pro Shock Trekking Poles - Women's aluminum foam 1 lb. 3 oz. Black Diamond Trail Ergo Cork Trekking Poles aluminum cork 1 lb. 2 oz. Black Diamond Trail Ergo Cork Trekking Poles - Women's aluminum cork 1 lb. Leki Corklite DSS Antishock Trekking Poles aluminum cork/rubber 1 lb. 2 oz. On a tight budget but still looking for the highest quality you can get for your money? Check out our recommendations below for what you can get for under a cool hundred bucks right now. We recommend these models because they offer high quality at an affordable, low cost. If around a hundred bucks is all you can spend, and you can spend every last cent of it, then your best value for the money is the Distance Z trekking poles pair by Black Diamond. So, while the shortest size won’t work for everyone, if it does then you can get yourself an awesome pair of hiking poles just under $100. These feature a 3-section foldable design with SlideLock technology makes deploying and locking poles into position quick and easy. And for aluminum shafts, I feel like the weight of these is pretty good and the foam grips feel comfortable in your hands. Based on performance and design, this Black Diamond Distance Z trekking pole set is ideal for hiking and trail running. They are very sturdy and easy to retract when not in use. Plus, we think that these are probably the lightest cheap poles that you can buy right now. If you’re on a budget or just looking for some good entry level trekking poles for beginners, then definitely consider the Black Diamond Trail Back Trekking Poles. These poles have an aluminum shaft and weigh in at 1-lb and 4-oz for the pair. They are made by one of the top brands in trekking poles, Black Diamond, which means that you’re getting high quality outdoor gear here at a great, low price. Overall, these trekking poles are a great value for the money. Probably my biggest complaint about them is that they have cheap rubber grips, which can get hot and sweaty in the summer heat. Plus, they are a bit heavier than I’d like for walking sticks. That being said, they have easy-to-use lever locks and the overall construction is very tough. A great choice for durability and affordability. Looking to take the kiddos with you on a hike? You can outfit them with this pair of poles so that you don’t have to worry about their safety out on the trail. If you do some of your hiking or other trekking with kids, then don’t forget to outfit them with some good poles as well. Probably the best trekking poles children right now are the Black Diamond First Strike poles. These things are ultra lightweight and design with the smaller hands of kids in mind – the grip is youth-sized. And the adjustment mechanism is super easy for the kids to use. The adjustment range on these is pretty high, which means that they will last your kids through several years of growth spurts. Plus, they have a great low price! And, they are designed for year-round use by your kids since they come with baskets designed for use in the snow. Bottom line: you’ll be hard-pressed to find a better option out there for your kids. 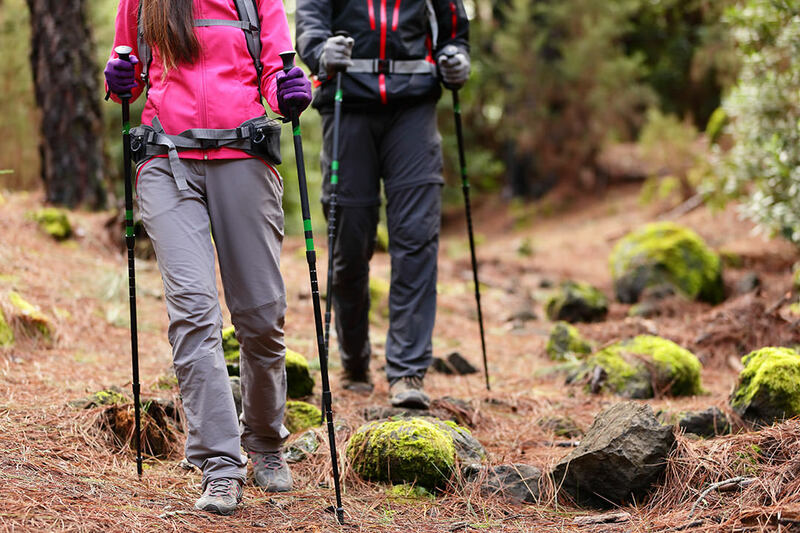 If you’re looking for gear that you can use all year round – from hikes in the summer to hikes in the winter snow, then we’ve got the perfect all-season trekking poles for you! This right here is probably my top pick overall. With the Black Diamond Alpine Carbon Cork poles, you get a lot of versatility and value for the money. These lightweight poles are packed with all the best features but remain affordable with a great price for the pair. The FlickLock Pro lock system on these just cannot be beat. It just doesn’t even compare to what you see on the entry-level poles. It has cork handles that are very comfortable and it is designed for four season use. It comes with baskets to use in the snow and baskets to use for hiking. The carbide tips are replaceable, which means if you use these poles a lot and wear them down then you just have a cheap placement cost for the tips instead of needing a whole new set of poles. And, the interchangeable Tech Tips allow you to switch between carbide and rubber tips to account for changing trail surfaces. Pretty great, huh? If you read the content above, then you might have scoffed and thought that you didn’t need trekking poles for your adventures. I admit, they are not the sexiest gear to be seen with. But, they do have their purpose and once you start using them, you will be a convert. And, to help you get there, let me share some reasons why I think you should give them a try. As you can see in the graphic above, trekking poles have a lot of varied uses. As you lift the poles with each step, your body gets into a rhythm that has actually been shown to improve your speed without increasing your fatigue level. I don’t know about you, but I really like the idea of getting to that lookout point more quickly without being more tired than usual. Since you will likely end up in areas that can be slick from water, mud, moss or other organic debris, the extra contact points of your trekking poles help to keep you from taking a tumble. You get better overall balance and stability. How many times have you seen a puddle or other questionable area in your path and wondered if you could safely cross through it? Well, with trekking poles you can probe the depth and stability of any obstacles in your path so that you’ll know if it is safe to keep moving. You can use them to reduce the strain on your body, which is a great way to prevent getting fatigued early on in a hike – especially if you are carrying a heavy pack. This is because the poles help to redistribute the force of that weight so that it doesn’t all go on your knees and ankles. Instead of using your bare hands to move away brambles and cobwebs, put those trekking poles to good use. They are a great way of holding debris out of your path as you cross. And if you are unlucky enough to come across a bear, dog or other wildlife, then you can use your trekking poles as a self defense weapon.